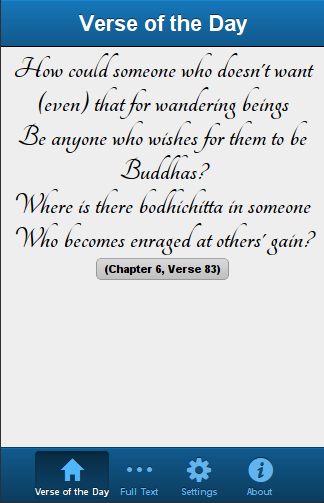 This little App displays one verse a day from Shantideva’s text “Engaging in Bodhisattva Behavior” (Bodhisattvacharyavatara) and allows to read through the entire text. “Engaging in Bodhisattva Behavior” is an outstandingly practical and inspiring Buddhist text that covers all the aspects of the Buddhist path. Shantideva (also spelled Santideva or Śāntideva) was a great Indian master who lived in during the 8th century CE. Two of his texts survive – the Bodhicharyavatara (the text that is displayed in this app) and the Shikshasamuccaya (“Compendium of Trainings”). Both texts are still used to the present day by many Tibetan Buddhists and especially the Bodhicharyavatara is one of the most cherished and most frequently taught texts in the Tibetan tradition. This translation of the text was done by Dr. Alexander Berzin (www.studybuddhism.com). Many alternative translations into various languages are available in book form.